The most successful fitness and weight loss stories are from those who can self-motivate and are willing to learn. These qualities are more valuable than having the world’s most qualified and expensive personal trainer at your disposal. Can be done from your own home. Uses minimal fitness equipment and utilizes body weight training. Is progressive for at least 6 weeks. Is designed to effectively burn fat, tone muscle and develop cardiovascular fitness. Won’t take you more than 30 minutes four times a week. …Then this is the one for you! Hi, I’m James Atkinson (‘Jim’ to my friends and readers). I’m a qualified personal trainer/fitness coach, competing bodybuilder and have a burning desire to help others reach their fitness goals. It is fair to say that I have learned the secrets of weight loss and fitness from my own personal journey. I have been fat, skinny and musclebound throughout my fitness career, and I really get fulfillment from helping and advising others when it comes to their goals. But my home workout routine is not something that will take up hours of your day. I can tell you that you won’t even need to train every day; you just have to follow the routine that will last less than 30 minutes for a maximum of four days per week; and each week, you will have a slight upgrade to the previous week. This type of consistent progressive training is a sure-fire way to get your fitness results! If I were looking for fat loss, muscle tone and total body fitness and I did not have access to a gym, this is what I would do. Although this is a “stand alone” fitness routine, I would NOT recommend this to the beginner to fitness because some of the exercises may be too advanced for someone just starting out. If you do happen to be a beginner, I would recommend my Home Workout for Beginners fitness routine. 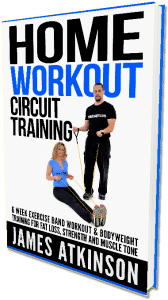 The home workout for beginners routine was designed as a “prequel” to this, and if you were to start with it, and then decide to try this, you will find that it blends you in very nicely. By all means, grab both of these books and plan for a 12-week progressive home workout routine instead of just 6 weeks. You will learn how important the planning aspect of your new routine is in both of these books. Whatever path that you decide to go down, I will wish you the best of luck and I’ll see you on the inside! Please remember that I am always happy to help where I can, so give me a shout out if you get stuck or have any questions.